Of all the four-letter words out there, the one that will probably cause you the most pain and anguish is “mold”. We already know how disgusting it is and where it comes from, but how can a tiny spore like mold damage a house? Like, physically? At Modernistic, we’ve repaired thousands of homes from mold damage (called “mold remediation”), and we’ve seen first-hand the destruction that mold wreak inside a home. 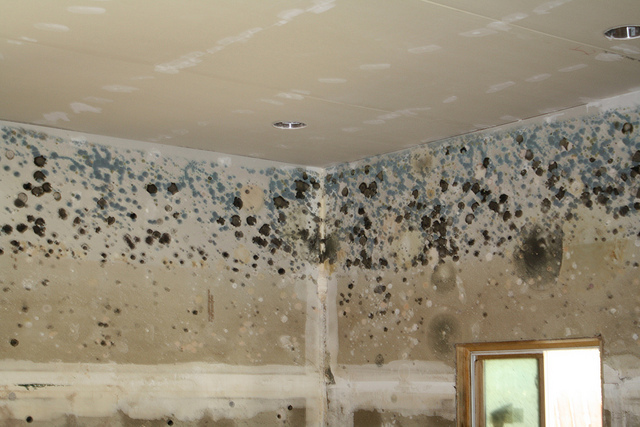 Here are some of the most common types of mold damage we encounter on a daily basis. Drywall – Since drywall is organic and porous, a mold infestation will permeate throughout the material very quickly. It’s possible to salvage drywall if the growth is caught quickly enough, but after about a day it’s usually best to remove and replace mold-affected sections. Carpet – Mold will grow best where it can get lots of moisture. With carpet, water will soak down into the padding beneath the jute backing. While you can certainly feel water-saturated padding when you step on it, the carpet itself doesn’t let you see what might be growing beneath. That’s why a professional mitigation crew will peel back your carpet and dry out the padding as soon as possible – that’s where potentially hazardous mold is most likely to be! Hardwood – Wood is another material that very susceptible to mold damage: joists, hardwood flooring, furniture, etc. Since wood is organic, it provides all the food mold loves to feed on. Depending on the location and severity of the infestation, often the safest option is to remove and replace affected wood materials. HVAC System– Since you can’t see what’s inside of your ductwork, it’s easy to forget about all the dust and debris that build up; after all, out of sight, out of mind! But the dust and debris are a fantastic food source for mold spores, and with enough moisture and oxygen, they can start growing without you even knowing. Once that happens and your furnace or central air kicks on, mold spores will circulate through your entire home, affecting more than just the inside of your HVAC system! Properly cleaning and disinfecting your entire ductwork system from mold growth requires specialized equipment designed to reach all affected areas, so it’s best to trust an air duct cleaning professional with any mold growth in the HVAC system. Indoor Air – Even if it’s not in your air ducts, mold growing anywhere in your home will affect your indoor air quality. In order to reproduce, mold gives off microscopic mold spores – you can’t see them, but they’re always floating around in the air. Depending on the strain of mold and the severity of the infestation, certain types of spores can cause harmful side effects. These can range from mild allergies to full-blown respiratory illnesses. These are just a few of the ways we’ve seen how mold can damage a house. If you ever suspect mold may be growing in your home, the absolute best thing you can do is deal with it right away. Call a professional mold remediation company before any of the above happens! If you catch it right away, “mold” will be the only four letter word you’ll have to use! Modernistic has been restoring Michigan homes from disasters since 1973! If you are dealing with a mold problem, trust the experts and contact us today. If snow is piled up against your home’s outer walls, windows, foundation, or doors, you’ll want to remove it before it starts melting. Pay special attention to your driveway and garage, where plows may have piled up mounds of snow. Your sump pump helps keep water out of your basement, and if snow melt starts to trickle in, you’ll definitely want it in working order. Also, make sure the discharge pipe is clear of obstruction and flows freely. 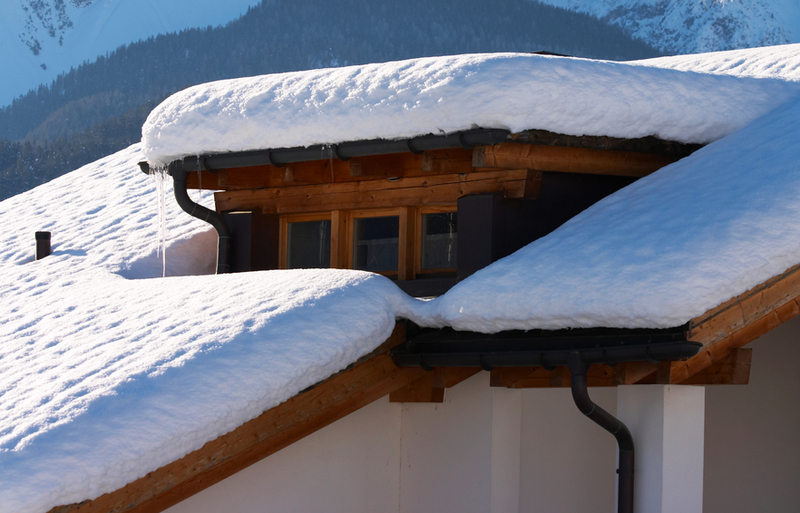 Clogged or improperly draining gutters may not be able to handle the additional snow melting from your roof. You also want to make sure your downspout leads the runoff at least 10 feet away from your home. As if we needed another reason to dislike snow! While we may not have a huge amount of the stuff this season, the danger of water damage is still present. Any time you have snow melting brings the possibility of runoff water ruining various parts of your home. Luckily, if you follow these steps, you can help yourself avoid a costly mitigation and dryout. For more info about home water damage, visit this page for the latest mitigation news. April showers bring basement floods. It may still feel like the dead of winter now (because it is), but with Michigan’s changeable weather, you never know when a sudden thaw might leave you in an ocean of trouble. As spring approaches, we can look forward to rain and melting snow raising the water tables in our neighborhoods. Especially when you have had a water problem before, this is the time of year you might start getting anxious. You can hire a professional to waterproof your basement, but if that is out of your budget there are a few simple things that you can do on your own. Water that pools around your house needs somewhere to go. Unfortunately, that place is usually your basement. If you know you need new gutters, that your existing gutters need cleaning, or that you should extend your downspouts, take care of it as soon as the whether warms. That way you’ll be prepared for spring storms. Have your sump pump serviced by a professional. There are many things that can go wrong with your sump pump. Tethered floats, the most common kind, are known for getting stuck on the side walls of the pit, or the mechanical pressure switch can fail. Sometimes your sump pump simply doesn’t have the capability to pump the amount of of water necessary, especially if your home is in an area with a high water table. The best way to keep everything running like it should is to have someone service your pump regularly. That way you’ll know there is a problem before your basement floods. Seal the small vertical cracks in your foundation. Basement walls will naturally form small vertical cracks as the house settles. This does not show a serious foundation issue. Wide horizontal cracks, on the other hand, indicate a larger problem that requires the attention of a foundation professional immediately. However, water will seep through any opening, so after the house settles seal any cracks you find. You can use DIY sealants from any hardware store, but for absolute security, hire a professional. If you already have standing water in your basement. Shut off any electricity that runs to this area before doing anything else. Then look for the source of the water. If it is coming from an interior leak, like a burst pipe, shut off the water to that section of pipe and call a good plumber. If it is coming from outside, your first priority is dry out the space and then address the larger drainage issues. In either case contact Modernistic for immediate flood mitigation services. We will be there in less than two hours, any time of day or night. Our IIRC technicians can determine the cause of the flood an immediately begin removing standing water. We will also provide top quality restoration services and assign you a specialized case manager to handle the insurance claims process. Helping Royal Oak, MI residents recover from flood damages for 40 years. Becoming a homeowner is a big step. Some of the skills you need to keep your home running smoothly are pretty easy to figure out, like shoveling your sidewalk or paying your energy bill on time. Others are a lot harder to master. The good news is that you can easily learn a bit about your plumbing, even though it might seem daunting at first. Moreover, the effort is well worth it. You’ll avoid the expense of learning something is wrong only after leaking water has caused a great deal of cosmetic and structural damage. Here’s a short list of things to look for that signal trouble. The supply lines in your home bring gas and water to your appliances. Water supply lines will run to the dishwasher, icemaker, toilet, water heater, and washing machine. These lines have supply valves which will cut off the flow of the water. Make sure these are working, since it’s important to be able to turn off the water before leaving on trips. Look for dripping water or leaking. Some of these supply lines carry a lot of water, and a broken line can cause a big flood. Again, corrosion around the connections or valves signals impending leakage. Look on floors and ceilings. Do you see water-damaged, cracked, or warped flooring near the base of the refrigerator (if it has an icemaker), bathtub, shower or dishwasher? Persistent dampness in these spaces will damage the floors, and probably means that there is a leak. If your bathtub or shower is not properly sealed, the accruing moisture can destroy the subfloor as well, creating an expensive repair. Brown watermarks on the ceiling show that the water is leaching through the subflooring. Act fast if you see them on the ceiling directly below a bathroom or a major appliance. Check for drainage issues outside the house. 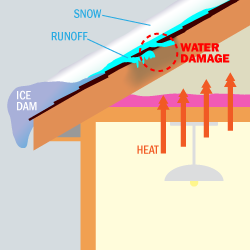 If your gutters are clogged or blocked by ice, water spills over the edges and lands right along the foundation. This water presses along your foundation walls looking for somewhere to go. You’ll end up with anything from elevated levels of dampness and mildew to a river water running through your basement. Make sure all your gutters are draining properly and that your downspouts carry the water at least five feet away from the house. Worst case scenario, untreated drainage issues outside will cause structural damage to your foundation and cost you tens of thousands to fix everything. Loose toilets are often leaky. Put your hands firmly on either side of the toilet and shake it gently. Does it rock back and forth at all? If the toilet is loose it often begins to leak around the base. To see if it is already leaking flush the toilet 3–5 times, then look carefully along the sides and behind the toilet. Water around the base will damage the floor, so even if you don’t see much leaking water, look at the flooring to see if it is cracked or warped. Finally, a spongy feel to the floor around the toilet means that the water has already begun to damage the subfloor materials. If you’re reading this, you’re probably not a plumber. While every responsible homeowner should know how to inspect their own plumbing, once you’ve identified the problem, call for reinforcements. A licensed plumber can confirm what you suspect and tackle the problem right away. Of course, sometimes you know there’s a problem only because you are floating boats across your basement. As soon as you’ve called your trusted plumber, make another call to Modernistic. We’re here with a 24/7 emergency response team to get that water out before it damages your home permanently. When disaster strikes, Modernistic is ready. Bailing out residents of Mt. Pleasant, MI for 40 years. Michigan winters are tough. Make sure you know what to do if your pipes freeze. You did everything you could to prevent frozen pipes this winter. You added extra insulation, safely dismantled hoses, wrapped pipes in extra insulation, and kept the house warm. Still, once the temperature falls you should have a plan for dealing with frozen pipes, just in case. Inspect your pipes for signs of freezing. Check on the pipes you think are most likely to freeze. If you see frost along the length of a pipe or an area that looks abnormally swollen your pipe is probably frozen. There is another less obvious indicator that your pipe is frozen as well. If you turn on the tap and nothing comes out, you may have a frozen pipe. You may not know exactly which pipe carries water to that section of the house, but check any nearby that lie along the exterior walls. Shut off the water to the frozen pipe. You should familiarize yourself with where water shut-off valves are located. In a crisis you don’t want to be running around like a slapstick comedian, getting soaked and looking for the shut-off. If learning where all the shut-off valves are seems too intimidating, at least know where the main water shut-off valve is for your home. When you locate the frozen pipe there are a few things you can do to thaw it out before it bursts. Warm the pipe with a safe heating source, like an electric heating pad, a hair dryer, a space heater, or heating tape. Never use a heat source with an open flame, particularly on plastic pipes. As you warm the pipes, leave the faucet open. When some of the ice melts, water will begin to run through the pipe, speeding the thaw. You’ll know you’ve melted all the ice once water pressure is back at full strength. What to do after a pipe bursts. The first thing to do when a pipe bursts is shut off the water supply to this particular part of the house. You want to cut off the gushing water quickly as possible. Then call a licensed plumber who is qualified to make the repair, and your insurance agent. Finally, contact Modernistic. Freezing temperatures might be round the clock, but we’re here too with 24/7 emergency assistance. Our mitigation crew will arrive within an hour and a half to begin assessing the damage and extracting the water. When frozen pipes flood your home, Modernistic is there. Serving Berkley, Michigan, for 40 years. Steps to take before you leave for the holidays. Leaving home for the holidays can make normally even-keeled people feel frazzled. Not only do we have to pack for ourselves and often small children, but we have to kennel our favorite pets, make sure that we haven’t left anything undone at work, and cram our cars with more presents than Santa’s sleigh. However, there are a few crucial steps to take before you leave your home empty over the holidays or your homecoming will be anything but peaceful. Anyone who’s left home without pulling the trash is familiar with the unpleasant results. Before you leave, try to catch up on a few simple cleaning tasks. Remove any perishable foods from your refrigerator and pantry; empty your dehumidifier; clear the garbage disposal; take out the trash; and clean the bathroom. Focus on eliminating the kinds of dirt and damp that attract insects and create odor and mold. Then for a really peaceful homecoming, leave fresh sheets on the bed and stock your pantry with some nonperishable breakfast options. Arrange some simple security measures. You’ll certainly remember to lock up, but you can also purchase a timer for your lights and program it to turn them on and off at regular intervals, so that your home appears occupied. It’s also smart to speak with a neighbor about keeping an eye on your house, and leave them a spare key. Leave this person with the number of your emergency contact, home alarm codes, and your travel itinerary. Call the post office and have them stop mail delivery to your home for the period that you are out of town, and arrange for someone come to remove snow. Deal with mail and bills. While you are in midair is not the best time to remember that your energy bill is due. Before you leave either prepay or schedule payment on your upcoming bills so that your vacation is entirely worry-free. This will also give you a realistic sense of your travel budget. While you are doing this, be sure to let your card company know you’ll be traveling, and to expect some unusual charges on your card. Protect your home from flooding. Leaving in the winter means that you have to protect your home from flooding. Dropping temperatures mean that burst pipes are a real possibility. Although you’ll probably turn down the heat before you leave, keep the household temperature at 50 degrees or higher to keep your pipes from freezing. Turn off the main water supply and open your faucets to drain them. Leave one tap open on the lower level of the house so that any additional water will drain off. You may also want to turn your water heater to the vacation setting to save energy while you’re gone. Modernistic is here, even when you aren’t. Sometimes the unexpected happens. Make sure that the person watching your house knows to contact Modernistic in case of a flood. Even if you can leave to return right away, you certainly don’t want water sitting in your house multiplying damage while you travel. Our 24/7 emergency team can be at your house while you are still standing in line wondering why TSA didn’t hire more help over the holidays. You can travel peacefully knowing that we are here to protect your home. Serving Middleville, MI for 40 years. We all love the festive warmth and good cheer of a roaring fire in the fireplace, or some decorative candles throughout the house. But according to the American Red Cross, nearly 47,000 fires occur during the holiday season each year. These cause more than 2,200 injuries, doing $544 million in property damage, and taking over 500 lives. Follow these few simple precautions to practice fire safety during the holidays. We all love the pleasant glow of candles over a special meal or on a winter’s evening. Seasonal scents add to the fun, with many companies marketing holiday themed candles that smell like cinnamon, pine, and Christmas baked goods. However, the U.S Fire Administration reports that candle fires are four times more likely to start during the winter holidays. Remember to keep candles well away from flammable decorations and far from the reach of children, and to extinguish any flames before leaving the room. Christmas trees shouldn’t become kindling. According to the records of the National Fire Protection Association one of every twenty-two home fires started by Christmas trees will take a life. An artificial tree is the safest choice. But if you must have that natural pine, make sure it is at least three feet from heaters, fireplaces, radiators, any other heat source. Also, always keep the tree watered so that the branches stay as green as possible. The moisture in the tree will act as a fire retardant if it is exposed to an ignition source. Finally, the tree should be firmly secured, so that mischievous pets and children won’t be able to knock it over. Check your lights and any other electrical decoration. Most decorations that use electrical power will come with specific safety recommendations. Even if you think you know the product it’s better to check the instructions. Some light strands can’t be used outdoors, and some can’t be used on artificial trees. All need proper maintenance if you’re hoping to reuse them several years in a row. Immediately dispose of any electrical decoration with frayed wires and replace dead bulbs as soon as possible. Always unplug your lights before you go to bed at night or when you leave home. Holidays come with a lot of extra cooking. You have everyone’s favorite dishes to make, contribute to the school bake sale, and bring your neighbor some of your famous Christmas cookies. Remember to keep the chaos under control. Anything that can catch fire, like potholders, dishtowels, flammable packaging, and wooden utensils, should be kept far away from hot surfaces. Keep a fire extinguisher on hand just in case you need to put out a stovetop or oven fire. Don’t neglect your normal fire safety measures. Managing everything over the holidays is enough to make a few things slip your mind. Don’t let it be fire safety. Just living in a home with the recommended number of working smoke alarms cuts fire fatalities almost in half. Make sure that all your alarms have working batteries before the holidays begin, so you won’t have to think about it as things get busier. And with all the extra laundry you have to do with thick winter clothing and guests coming to town, make an appointment to have your dryer vents cleaned regularly by a professional. Little things make a big difference when it comes to fire safety. If the worst does happen, Modernistic is here. A fire is one of the most traumatic events a family can go through. After recovering from the initial shock, you are left trying to put your life and home back together as quickly as possible. When disaster strikes, Modernistic is at your side to make the restoration process as painless as possible. Our certified technicians are available 24/7 to guide you through the restoration and mitigation process. We will also work with your insurance to coordinate the billing and rebuilding process. Check our website for our comprehensive list of services here, and contact us for immediate assistance. Serving East Lansing, MI for 40 years.